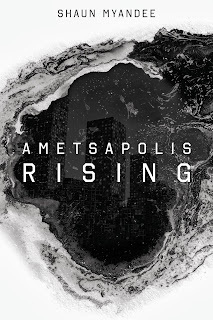 Shaun Myandee's "Ametsapolis Rising" is a vast, post-apocalyptic sci-fi with a riveting plot and unique world that will have even the most jaded sci-fi fans clamoring for more. The story is set in the 24th century in the futuristic city of Ametsapolis, the last city on Earth, where humans depend upon cybernetic implants to survive the harsh environment. Although the implants are humanity's saving grace, they are also used by the government for control. A mysterious group called the Zorastran Order uses special implants that give them extraordinary powers. The ambitious Jonas Evermount is trained by the order because of his unique way of harnessing the power of the implants. After much training, Jonas leads a rebellion against the corrupt government of Ametsapolis and is joined along the way by a geneticist and researcher with similar goals. The plot is filled with twists and turns, keeping the reader on the edge of his or seat the whole way. The characters in "Ametsapolis Rising" are dynamic and interesting; one of Myandee's strengths is showing the reader what drives each character. The technology and world Myandee created are unique and well-thought out. The book's pacing is not too fast and not too slow, perfectly leading up to the dramatic climax. Overall, "Ametsapolis Rising" is a fresh sci-fi novel that is a must-have for anyone who likes a gripping story.